Our Thanksgivings are rather quiet with just me and the girls. Years ago, though, I had a streamlined system for preparing dinner for a dozen or so people while managing some semblance of sanity. There’s a lot you can do to prepare in advance, and it all starts with making a list. Setting your menu is the foundation to planning how and when to get it all done. 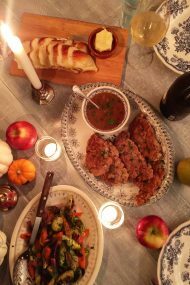 I thought it would be helpful to share some things you can do even now, three weeks in advance, to make the third Thursday in November a more peaceful cooking day. Grocery Shopping: Beat the crowds, and get all your dry goods shopping out of the way now. This way you’ll just need to pick up the turkey and fresh produce a few days before, minimizing your time amongst the crazy crowds at the grocery store. 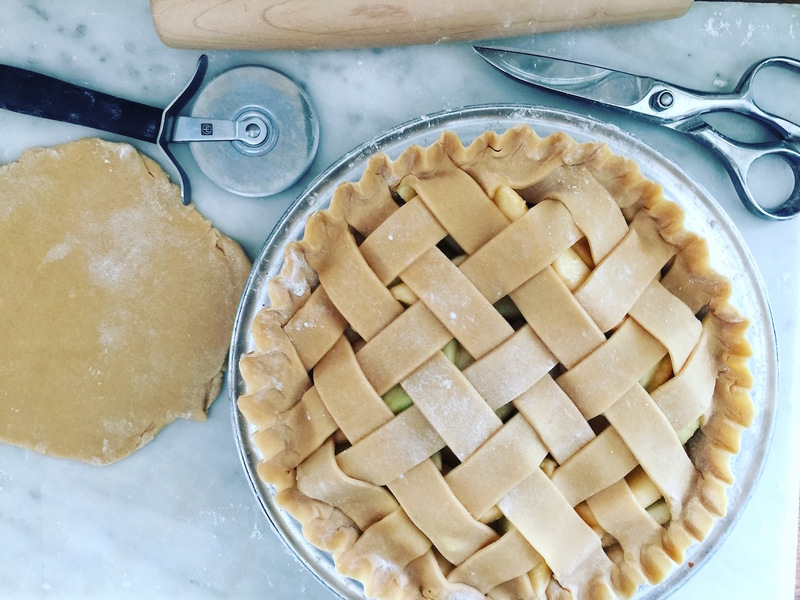 Pie Crusts: you can make your pie crusts now, roll, and freeze them. 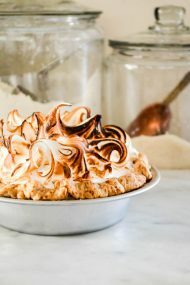 Place them in the fridge 48 hours before you plan to bake your pies so they can thaw out. I love using pie crusts—they’re super flaky! Pie Filling: you can’t really prep fillings in advance, but you can pre-measure ingredients. Chopping nuts for fillings is another thing you can do now. Be sure to label everything with the ingredient name and amount so you don’t have to second guess or measure again when ready to bake. 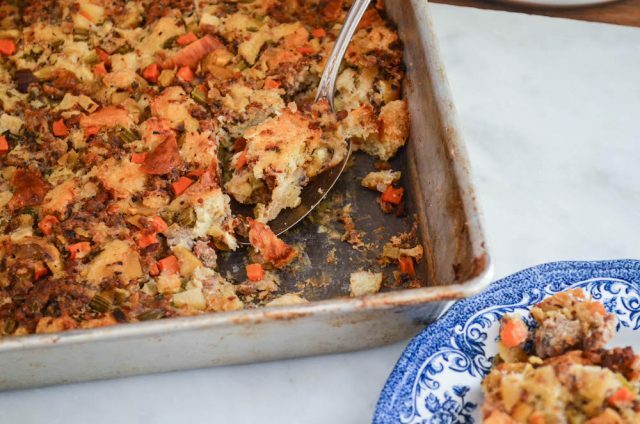 Stuffing Base: If you’re making a regular bread-based stuffing, you can bake the bread (if you plan on using homemade), cube it, and dry it out (either leaving the cubes out single-layer on a tray, or in a low-oven). Store the dried cubes in an sealed, air-tight container. If you’e making cornbread dressing, measure out the dry ingredients for making the cornbread, and label the containers. This way you can just dump and bake when ready. 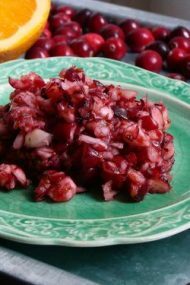 This is an amazing stuffing recipe (feel free to omit the meat for a vegetarian version). Stuffing Aromatics & Nuts: Go ahead and chop up any veggies and aromatics included in your stuffing recipe (carrots, celery, onions, garlic), and store them in a ziptop bag in the freezer (don’t forget to label). 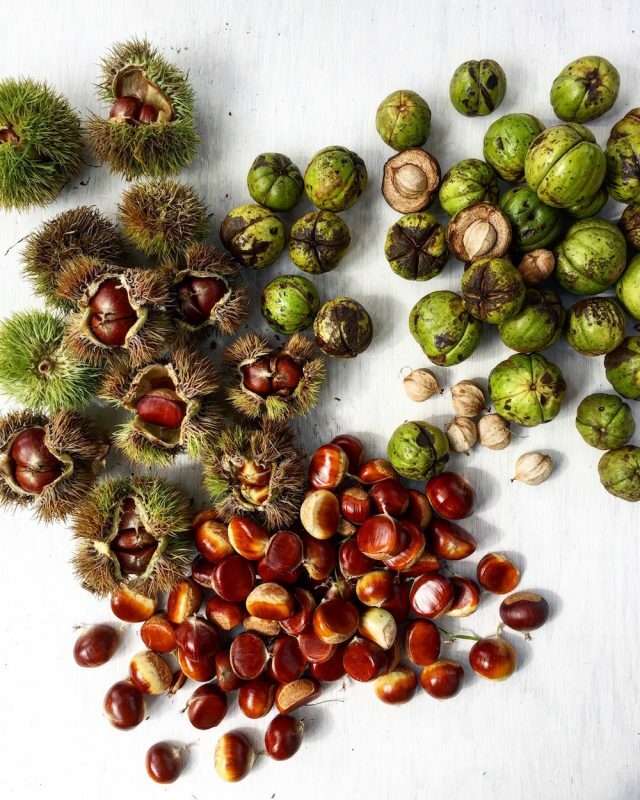 It’s also okay to roast, peel, chop & freeze any nuts (read this for the perfect, foolproof method to roast chestnuts). Store them in the fridge or freezer. Stocks: you can make a quick stock from giblets the day of for the gravy, but I always needed more stock than that yielded. If that sounds familiar, go ahead and make some homemade stock now, and freeze it. You can also opt for this homemade vegetable bouillon, and follow this recipe to make a vegetarian gravy (just swap out the chicken stock).